Consider a setting where multiple speeches are held simultaneously in one single space, like an exhibition hall or hotel ballroom. Each speech is repeated every hour and people in the audience can decide which speech they would like to listen to and at what time. Question: Is that possible, or will it lead to a cacophony of speeches reverberating in the room, making it difficult for people to understand the speaker they are listening to, causing fatigue, reduced interest and ultimately meaning people leave the event altogether? The solution is quite simple: all you need to do is isolate each speaker’s voice and deliver it to the ears of those people listening to their speech. This is where duvall’s Infrared Language Distribution system comes in. It is a system that most people would only see fit for a setting where simultaneous interpretation delivers a single speech to the listener in his or her native language. However, by assigning different language channels to each individual speaker, people can tune in to the speaker they want to listen to by selecting the right channel on their receiver. They get a clear and highly intelligible sound delivered through their headphones. Even though simultaneous speeches are held in the same hall, people can listen to their preferred speaker without disturbing ambient noises or echoing sounds coming from other speakers elsewhere in the room. 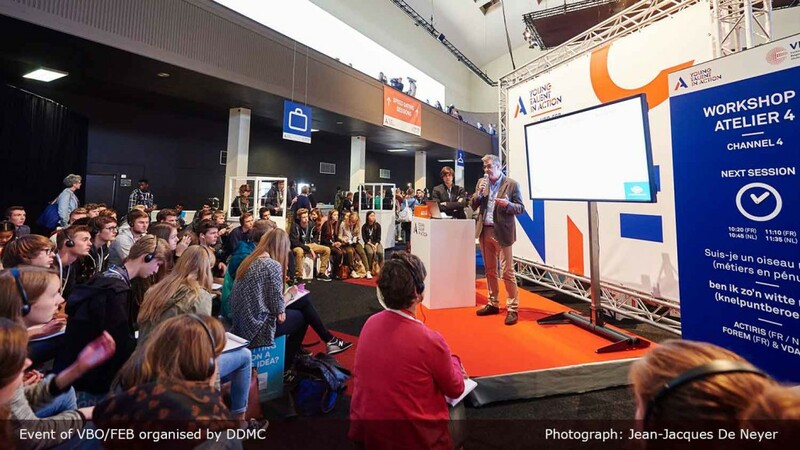 A beautiful example of this kind of set up was the event ‘Young Talent in Action’, organised by VBO in Belgium, aiming at bringing the discrepancy between young, unemployed talent and the many unfilled job positions into the spotlight. In one exhibition hall, seven different speakers’ corners were set up in ‘Paleis 10’ at Brussels Expo. Seven different workshops were repeated all afternoon, alternating between a French and Dutch version. Visitors could decide which workshops to attend and pick a time slot. The event was attended by at least 1750 youngsters and over 1000 employers. So you can imagine the buzz in the expo hall that made it impossible to understand a speaker without the help of the right technology. Together with event organiser DDMC, duvall provided the solution and equipment for this set-up. Populating seven language channels with the speeches of the individual speakers and installing Infrared Radiators at each speakers’ corner provided a simple solution to a problem that could not be solved with amplifiers and speakers. Visitors could borrow one of the 1500 Infrared receivers and headphones that were handed out, go to the workshop of their choice, tune in on the right channel and listen to the speaker. The audience was thus fully focused, without the discomfort of having to make great effort to understand what was being said. Flemish television channel VTM created this video report on the event. Notice the attendees wore receivers to tune into the speeches of the workshop they attended. The simultaneous speeches and crowd noise in the hall would have made it very difficult, if not impossible, to clearly understand the speaker without duvall’s solution. Simultaneous interpreting: do I have a suitable venue?